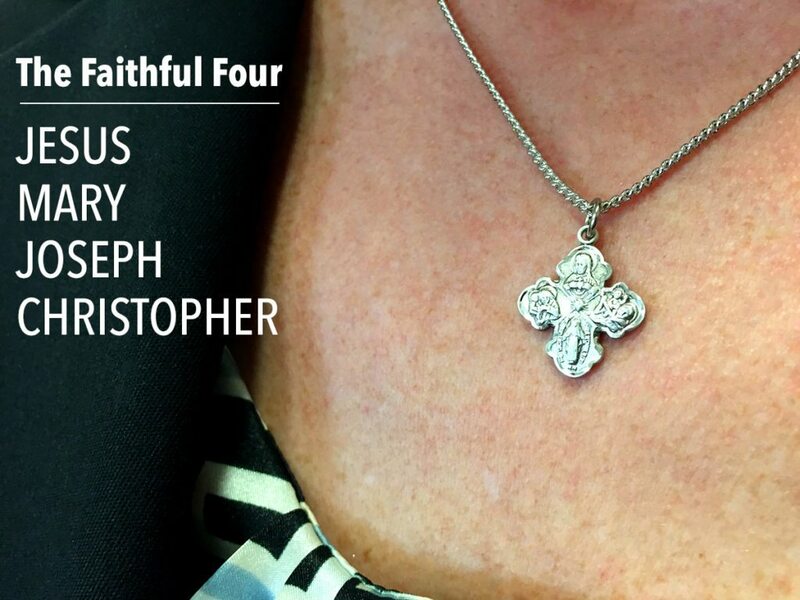 ​Does Wearing Religious Medals Express our Faith? ​The practice of wearing religious medals dates back to the 16th century when Pope St. Pius V began blessing medals containing the images of Jesus and Blessed Mary. As Catholics, wearing a medal is an outward expression of our faith. It tells the world, I am a follower of Christ. Wearing a medal with the image of Jesus on it also acts as a visual cue for us to pray to our Lord, asking for His protection and counsel. When we wear a medal of a saint or of the Blessed Virgin, we are motivated to live a life similar to how they lived — dedicated to Jesus. We can also pray to Blessed Mary and the saints asking them to intercede for us before the Lord. ​Why Wear the Four Way Medal? 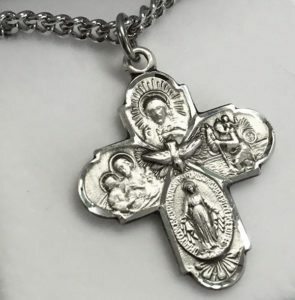 ​There are many religious medals Catholics can choose to wear — from medals of Our Lady and patron saints, to Jesus and the Holy Spirit. One particular medal — the Four Way Medal — is a popular choice because it combines four devotional images in one. Formed in the shape of a cross, it’s comprised of the Sacred Heart medal, St. Christopher medal, St. Joseph medal, and the Miraculous Medal. A dove, representing the Holy Spirit is in the center. The back of the medal usually features the image of Our Lady of Mt. Carmel and the Miraculous symbols along with the phrase, “I am a Catholic please call a priest.” In the event of a serious accident, a priest can be called to pray for the injured. Some variations of the medal have the words, “St. Joseph pray for us” and “St. Christopher protect us” on the back. ​No one is exactly sure when the first four way medal was created or why St. Christopher and St. Joseph were chosen among all the saints to be incorporated into the design. Undoubtedly, their significance in the history of the Catholic Church played a role. Let’s take a closer look at the different components of the medal and why they are meaningful. ​The Sacred Heart of Jesus is one of the most recognizable depictions of Jesus. Jesus’ heart — wrapped in thorns, bursting into flames, and bleeding — was revealed by Jesus to a French Nun, by the name of Margaret Mary Alacoque, in 1673. The thorns represent our sins and how our sinning pierce Jesus’ heart; the flames represent His burning love for us; and the dripping blood represents the blood He shed for our salvation. During one of His apparitions, Jesus told Margaret Mary, “Behold this heart which has so loved men that it has spared nothing, even to the point of spending itself and being consumed to prove its love to them.” This image reveals the sacrificial love Jesus has for all of us. ​Known as the patron saint of travelers, St. Christopher comes to the aid of those on a journey. Legends surrounding his life tell of the story of a boy who asked St. Christopher to carry him across a river. As St. Christopher placed the boy on his shoulders he notice that the weight of the boy grew heavier and heavier, becoming unbearable. According to the legend, the boy was actually Christ carrying the burden of the weight of the sinful world. ​As the guardian and protector of Jesus, St. Joseph is the patron saint of the universal Church. When we pray to St. Joseph, we ask him to protect, guide, and care for us just as he did for Jesus. ​There are many stylistic variations of the four way medal. Some are simple and understated, while others are ornate and striking. They are filled with unending inspiration, meaning, and beauty and make a great gift for anyone, whether they’re receiving a sacrament, going off to college, moving away, or battling an illness. Laura A. Magnifico is a freelance copywriter from Connecticut. She was raised Catholic and attended Catholic school from kindergarten through high school. As an adult, she continues to practice her faith and enjoys writing on Catholic topics.